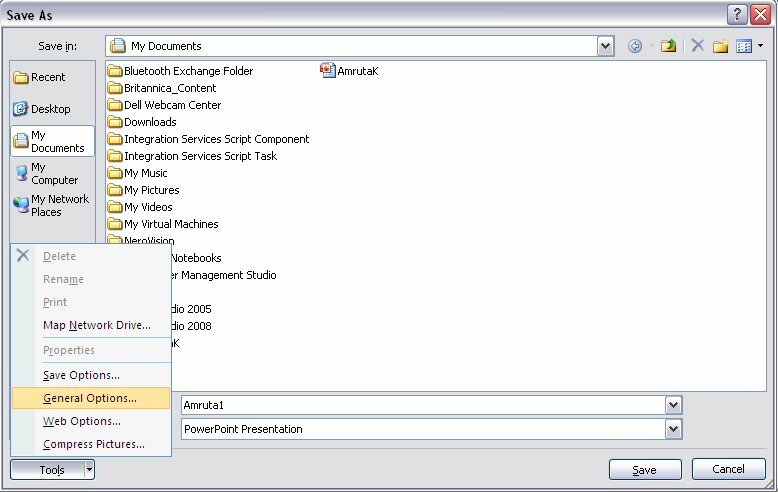 In this article, we’ll share with you a way by which you can prevent other people from opening or modifying your documents, presentations and workbooks in Microsoft Office 2007. Note: Passwords are case sensitive. And remember the passwords because Microsoft cannot retrieve forgotten password. 3. Now type the password again in the Confirm Password dialog box, in the Reenter password box and click OK.
4. To save this password, save the file. In this way your file is password protected. 2. 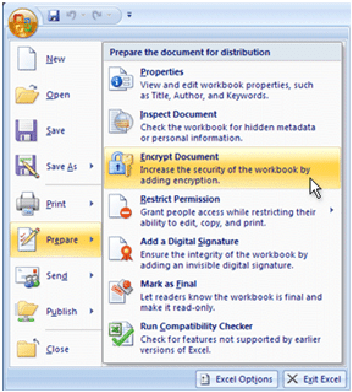 Click the Microsoft Office Start Button -> Prepare -> Encrypt Document. 4. 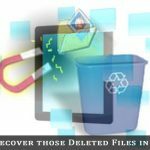 Save the file, the password is removed from your word document. You can even set a password to allow others to modify the document. 1. Click the Microsoft Office Start Button, click Save As, and on the bottom of the Save As dialog, click Tools. 2. On the Tools menu, click General Options. 3. 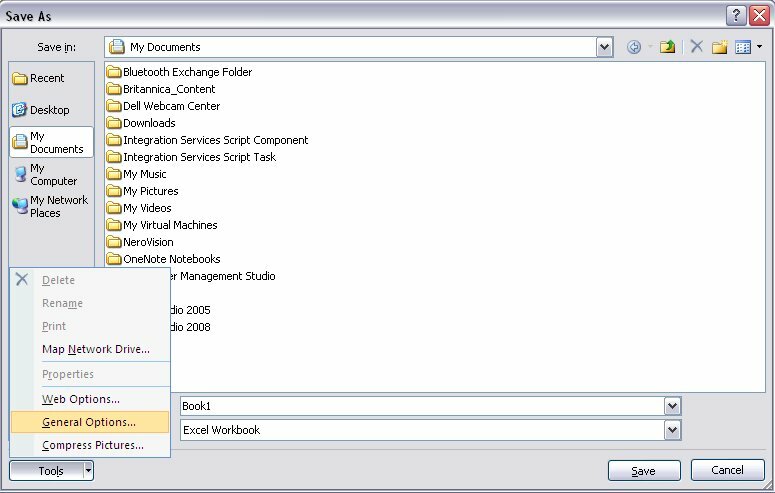 The General Options dialog opens. 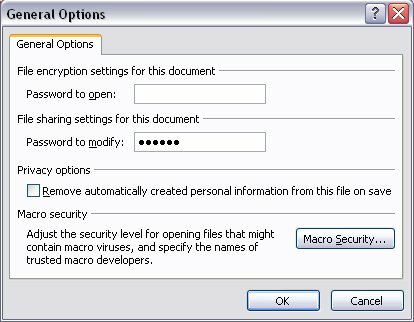 Under File sharing options for this document, in the Password to modify box, type a password. 4. In the Confirm Password dialog, re-type the password. Click OK.
To remove the password, repeat the above instructions and then delete the password from the Password to modify box. Click Save. 1. Click the Microsoft Office Start Button, point to Prepare, and then click Encrypt Document. 2. In the Password box, type a password, and then click OK (You can type up to 255 characters). 3. In the Reenter password box, type the password again, then click OK.
1. Use the password to open your password protected presentation. 2. Click the Microsoft Office Start Button -> Prepare, then click Encrypt Document. 3. 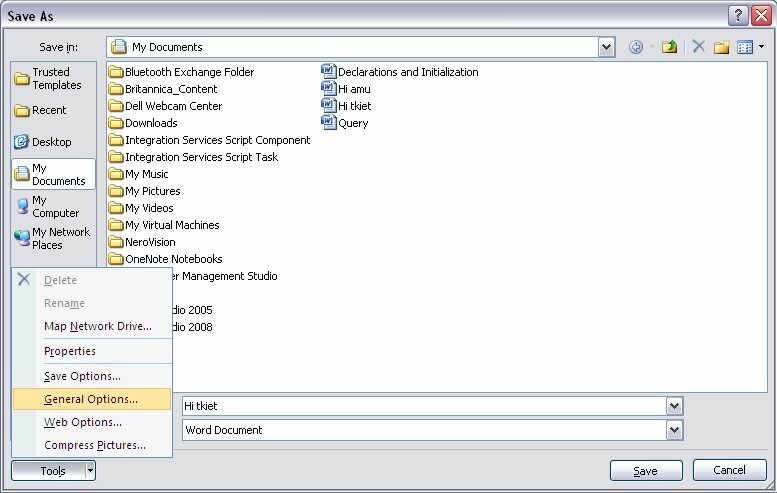 The General Options dialog opens. Under File sharing settings for this document, in the Password to modify box, type your password. 4. 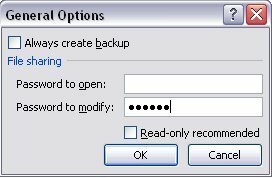 In the Confirm Password dialog, retype the password, then click OK.
To remove the password, repeat the above instructions and then delete the password from the Password to modify box. Then click Save. 1. 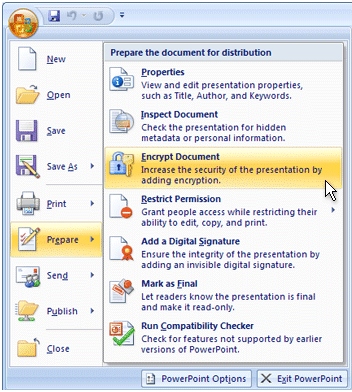 Click the Microsoft Office Start Button -> Prepare -> Encrypt Document. 2. In the Password box, type a password, and then click OK(You can type up to 255 characters). 3. In the Reenter password box, type the password again, and then click OK.
4. To save the password, save the file. Here, your file is password protected. 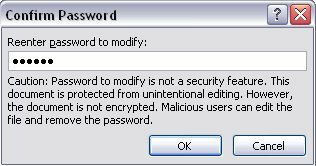 To remove password protection from your Excel spreadsheet; perform same steps followed for Microsoft Office Word and PowerPoint. 1. Click the Microsoft Office Start Button, click Save As, and on the bottom of the Save As dialog, click on Tools. 3. The General Options dialog opens. 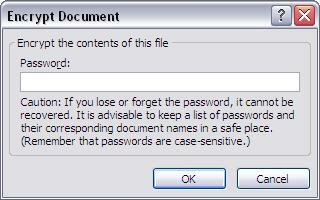 Under File sharing, in the Password to modify box, type a password. Note: To remove the password, repeat these instructions and then delete the password from the Password to modify box. Click Save. Share your views and opinions in the comments. Amruta is pursuing M.E. Computer Science in “Ramrao Adik Institute of Technology, New Mumbai”. She is interested in software testing and photography. Follow her on Twitter and on Google+.